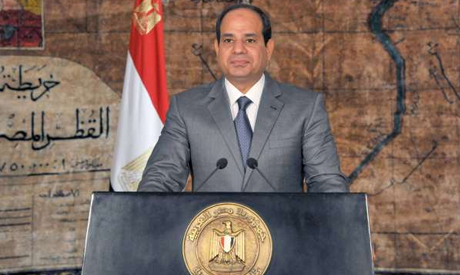 President Abdel-Fattah El-Sisi issued a presidential decree (no.231/2014) on Tuesday asking the Supreme Electoral Commission (SEC) to meet to begin necessary procedures for holding parliamentary elections in Egypt. Presidential spokesman Ehab Badawi said El-Sisi's decree is in line with two recent laws aimed at regulating the House of Representatives' elections and the exercise of political rights. The election of a new parliament in Egypt represents the third – and last – step of a political roadmap that has been adopted since the overthrow of Islamist president Mohamed Morsi on 3 July 2013. The first two steps included the drafting of a new constitution in January and the election of ex-army chief El-Sisi as president last month. Badawi said El-Sisi's decree is also in line with article 230 of the new constitution which stipulates that the parliamentary polls must begin within six months of the passing of the national charter – ratified by a popular referendum on 18 January. Badawi indicated that according to article 4 of the new political rights law, the commission mandated with supervising the polls – the SEC – must be headed by the chairman of Cairo's Appeals Court and include another six members: the two most senior deputies of the Chairman of the Court of Cassation; the two most senior deputies of the Chairman of the State Council (administrative courts); the chairmen of Alexandria's Appeals Court and the Chairman of Tanta's Appeals Court. As stipulated by article 5 of the political rights law, the justice minister must upgrade the SEC's make-up so that the president can ask it to meet to prepare for the polls. The make-up of the SEC was upgraded in the last two weeks by the justice minister so that Judge Ayman Abbas was appointed chairman of Cairo's Appeals Court – after Nabil Salib, the former chairman who led the SEC in supervising January's constitutional referendum, reached retirement age on 30 June. The most senior deputies of the chairman of the Court of Cassation have been named as Ayman Mohamed El-Gabri and Ahmed Gamal-Eddin, while those of the State Council are Mohamed Qishta and Gamal Nada. The current chairmen of Alexandria and Tanta's Appeal Courts are Magdi Demian and Helmi Mossad. Article 7 of the political rights law stipulates that the SEC take charge of setting the dates for registration and voting in the elections. Egypt's previous constitutions granted the president sweeping powers, which they used to manipulate parliamentary polls. Tuesday's decree is expected to be completed by a new law aimed at redrawing electoral districts. Egypt's new parliament – the House of Representatives – will be composed of 567 deputies. The new house law specifies that 75 percent of seats (420) will be elected via the individual candidacy system, while a mere 20 percent (120) will be reserved for party-based candidates. The remaining five (27) will be appointed by the president. Political analysts expect parliamentary elections to be held at the end of October. sisi new dictator for 25 years old?